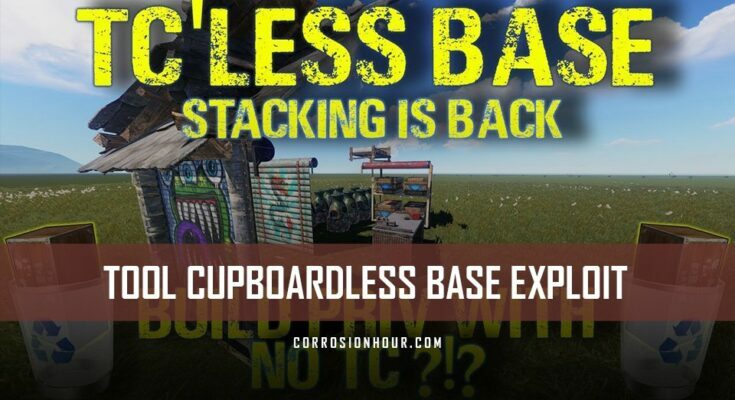 Our partner Snowballfred is back with the tool cupboard-less base exploit that can be used in your RUST base designs. Note that this exploit has been reported to Facepunch and has existed for quite sometime now. Pro tip: Can be used to setup non-decaying foundations with auto-turrets, concealed by high grass. Be sure to browse Snowballfred’s RUST Custom Map videos and don’t forget to subscribe to his channel for alerts on his latest work! Right guys, today I’m going to show you how to get a base with building privilege but no tool cupboard inside it. Pretty random exploit, a lot of tool cupboard exploits coming out these days an here’s another one. It’s a bit of a re-take of one that’s been done before but in a bit of a different light. Sweet, so start off by dropping a lovely line of foundations square or triangle doesn’t really matter, doesn’t matter how long doesn’t matter how high. Its up to you at the end of the day. Alright that should be sufficient place one more and were going to switch to some walls and we’re going to put three of them down. Be sure to leave this foundation at the very end here, we’ll come back to it later and revisit what its purpose is. And what we’re going to do is put some shelves and some shelves, you’ll need to build stairs in vanilla to do this. We’re going to place some more walls, some more shelves, and then we’re going to come back here. And were going to delete this foundation, and the bottom pair of shelves and then all of those walls and this will leave us a lovely floating shelve set. But that’s only some of it, what we’re going to do now build two walls back up and once again you’ll need to use stairs if in vanilla but for the sake of the video god mode FTW and no clip as well. Place ya tool cupboard, authorize, and drop some wood and stone inside. Now this is pretty important. You’re going need to break the walls and foundations backwards in the order that you placed them. You may have already noticed that i still have building privilege yet I’m miles away from the tool cupboard now. There’s probably some long winded explanation as to why this is happening. I probably know it, but I really cant be bothered telling you. Wall off your little example base or how ever your planning on doing this and upgrade it. This is why we put stone in the tool cupboard, because we were going to upgrade this to stone. And here we have it a base with no tc! but we still have building privilege! Now we will revisit that foundation that we left there and discover what its purpose was. Once again this is just an example, this isn’t meant to be perfect or anything this is just showing you the trick. Okay place one foundation down, delete this foundation. Come back with ya wall and drop the door way down. Chuck your no clip on or build stairs and continue to place walls around the outside. One more layer of walls, last but not least the ceiling, scoot around and upgrade that and last but not least drop a tool cupboard in this base. And now this base has got a tool cupboard of it’s own while also housing the tool cupboard for the other base. Now you can use good ole’ Lloydz trick, of building the foundations back from each base to overlap tool cupboard coverage an that giving an added aspect of security. Towards the end of this video I’ll leave a time lapse of a build/base that I did, which has 7 tool cupboards in it and all the building zones overlapping. And here we will get the error saying we cannot connect two buildings with cupboards, but as you can see they are both clearly covering each other at this point. The added bonuses, if you were using this for a satellite base or external tool cupboard, is there’s not actually a tool cupboard in there and you can stash an auto turret in here. And ole’ raiders will come in and go bang and get a face full of turrets, pretty good trick. Have fun guys, enjoy the time lapse.